FROM playing in the Sussex County League to representing your country in World Cup qualifiers in the same month sounds the stuff of dreams. However, that is precisely what Shoreham Football Club goalkeeper Nic Taylor will be doing next month as the 23-year-old has been called up to the Montserrat squad for their upcoming World Cup qualifying games. While Mussels will be preparing for a league match with Horsham YMCA, Taylor will be in the Caribbean getting ready to take part in the first round of qualifying games for the 2018 World Cup. Montserrat are ranked 170 in the world and take on Curacao over two legs. The first leg is in Curacao on March 27, before the second leg takes place on March 31. The winners are then set to take on Cuba in two more qualifying games, before the winners of that tie get to the World Cup group stage qualifiers, along with the likes of Mexico and the USA. Taylor, a PE teacher and football coach in London, has two caps for his country, when he kept clean sheets in the qualifying stages of the 2014 Caribbean Cup. 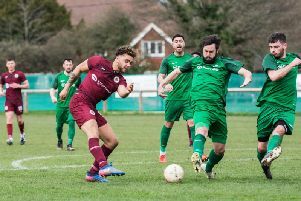 The 23-year-old, who joined Sussex County League side Shoreham from Cray Wanderers this season, cannot wait to represent his country again and said: “It’s brilliant and I can’t wait. “We have a lot of qualifying games until we can play the likes of America and Mexico in the qualifying group stages. We’re ranked higher than San Marino, for example, but they go straight into the qualifying groups, without playing in a preliminary stage first, and then play the likes of England, Italy and Germany. “It’s going to be great, though. The squad has a training camp at St George’s Park this week and that will help build confidence going into the qualifying games as we’ve got a strong squad and I think we can surprise a few people. Taylor, who played for Millwall, Crystal Palace and Dagenham as a youngster, was full of praise for Mussels boss Kane Louis after he received the call-up and said: “I want to be playing games. I’m still relatively young in terms of a goalkeeper but I still have to be playing games. “If I’m not playing, I can’t show what I can do, so playing week in, week out, is great and I’ll look to kick on now. Mussels chairman Stuart Slaney said: “The club are chuffed to bits for Nic and it’s good for the County League as well. I don’t know if a player from the County League has ever been called up to represent his national team before. “It just goes to show that you don’t have to be playing at League One, League Two or even Ryman level to get recognition and to play for your national side.